Argenteuil is situated on the Seine, nine kilometers to the north-west of Paris, and Monet rented a house there in 1871 soon after his return to France after the Franco-Prussian War. He remained there for six years and rarely traveled elsewhere, in contrast to the restless years of the preceding period. Monet's work developed considerably at Argenteuil as did that of other Impressionist painters. At various times Renoir, Sisley, Caillebotte and Manet joined Monet there, and the common purpose and style of their work in the period 1873-5 marks it as one of the highpoints of the movement. At Argenteuil the river is crossed by two bridges: one an old wooden structure supported on stone piers and used for pedestrian and road traffic, and the other a more recent steel and concrete railway bridge. The latter typically exemplified the perceived modernity of new architecture and technology; both appear in Monet's works of this time. 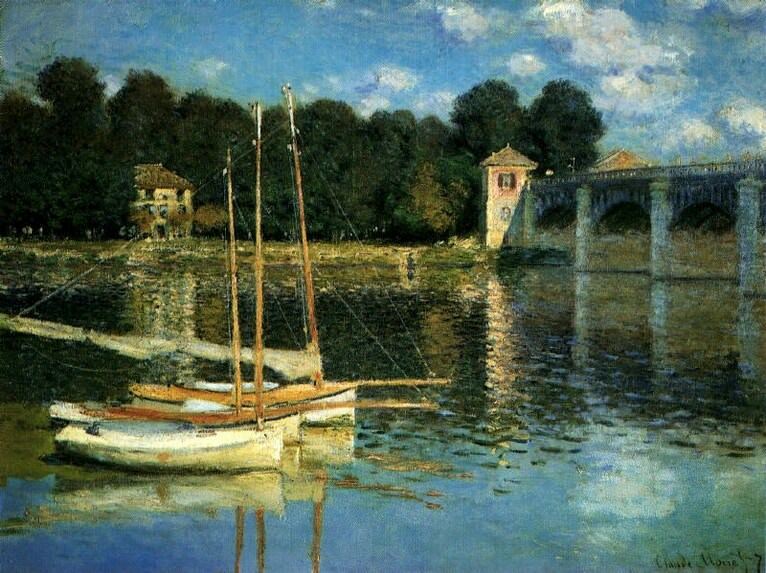 The road bridge shown here was more suited to quiet, contemplative images, and the calmness of the scene is emphasized by the sailing boats moving steadily along the river. (Argenteuil, like many of the Seine towns near Paris, was a popular destination for holiday-makers from the capital in the summer.) The depiction of the water illustrates the Impressionist technique of applying discrete brushstrokes to build up the image and describe the varying light effects. During this period in Argenteuil Monet began to work on near identical subjects in separate canvases, thus presaging the series paintings of the 1890s and onwards. He painted a variant of this work in the same year from a position a little further down the river from the bridge. He also painted a pair of pictures (1873 and 1874) of the railway bridge in differing weather conditions.